Let us be very clear, this is a hypothetical based on historical track records of union negotiations and the performance of our Direct Relationship. 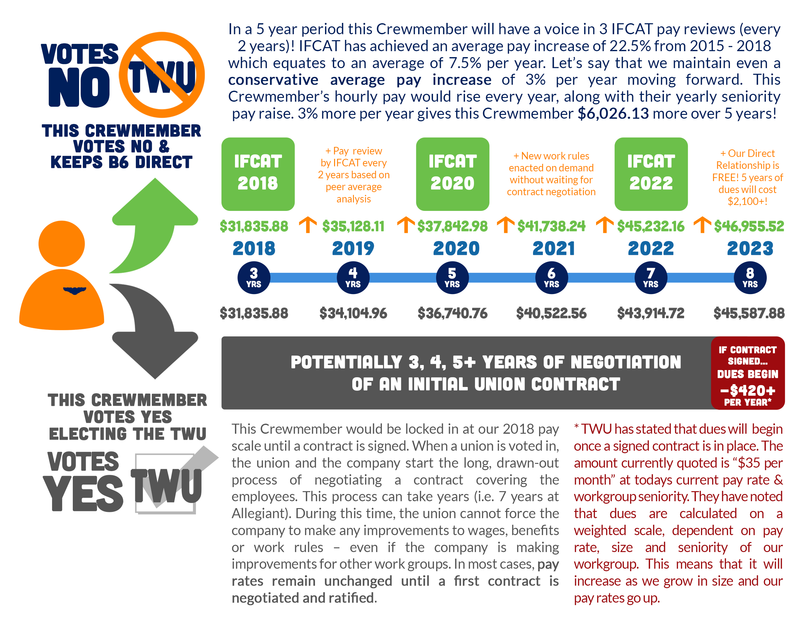 We used historical reference to project what the next 5 years COULD look like for Crewmembers at JetBlue if we keep our Direct Relationship or elect to be represented by TWU. This example Crewmember has 3 years seniority, is on the Premium Pay model and flies 87 hours per month. At 3 years seniority, this Crewmember’s hourly pay in 2018 would be $31,835.88. This figure ONLY includes base & premium hourly pay for 87 hours flown. IFCAT’s average pay increase from 2015-2018 was 7.5% per year. 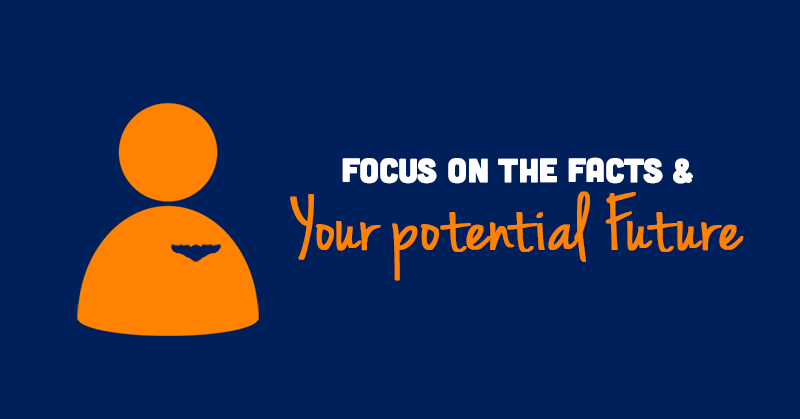 Since IFCAT studies our competitors pay scales by comparing OAL’s negotiated contracts, we are confident that a conservative 3% increase per year moving forward would be a safe figure to forecast this Crewmember’s growth in pay along with her seniority. Keep in mind the figures only include base and premium hourly pay (not including per diem, SubBluementary pay, F1, International, LOD, Night Override, etc.). Every 2 years the IFCAT team reviews the pay scales/other pay elements of other airlines, and uses this information (along with your feedback from the survey) to shape their recommendations for Inflight’s future pay. In addition, work rule changes are solicited regularly through our SpeakUp survey, IVC and IFCAT’s work rules committee and action plans are developed to make changes on a rolling basis. JetBlue makes a significant investment in maintaining our Direct Relationship by covering all the costs associated with operating programs like IVC, Tell Inflight, Steering Committees, etc. We enjoy our seat at the table for free. In this example 5 year period, with our Direct Relationship, this Crewmember gained $6,026.13 from their pay increase and did not have to pay for any of the programs JetBlue provides. In a 5 year period following a ratified contract, this Crewmember will be paying at least $2,100+ in dues! This is the verbiage from TWU: “Retroactive Pay” is a negotiated item and is intended to cover the time between the time a Contract becomes amendable or expires and the time a new Agreement is reached. Since this is a first contract, there was no previous contract to go back to. Retroactive pay does not apply to a first contract. We’ve based our forecast of due’s beginning at contract signature on the currently quoted $35 per month. While this Crewmember wouldn’t be paying dues until a contract is ratified, once it is, whatever pay increase they get will be automatically reduced by paying out dues of at least $420+ a year. 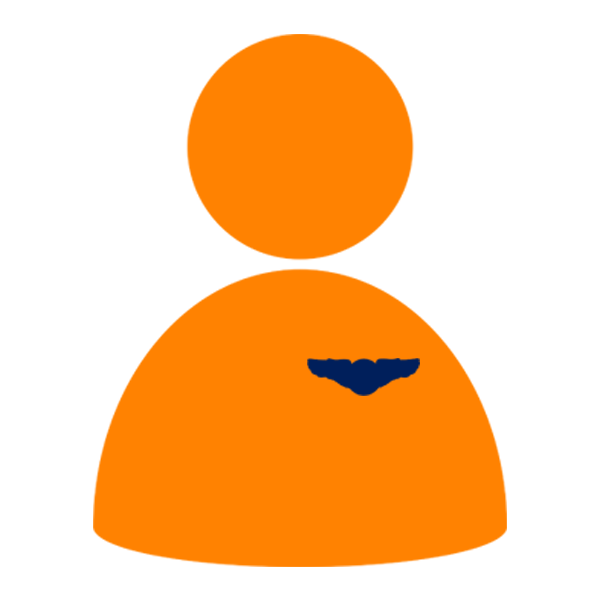 Keep in mind dues will actually be calculated as a weighted average at the time a contract is ratified based on the current pay scale, size and seniority of our workgroup.